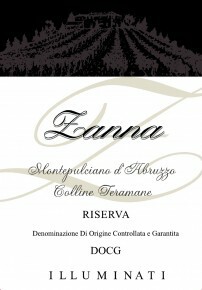 Montepulciano Riserva ‘Zanna’ is the winery’s flagship wine, a 3 Bicchieri Award winner for years in a row. Produced only in the best vintages, Zanna is made with a selection of grapes from old vines (45 years old on average) from a single vineyard, pergola-trained with monitored low production through green harvest. Zanna is intense ruby red in color, turning garnet with time. There are hints of blackberry, berry fruits, and dried flowers on the nose. On the palate the wine has great texture and soft tannins, with an elegant and long finish. It will pair perfectly with red meat (especially lamb), game, truffles, and aged cheeses, particularly gorgonzola. Zanna was not produced in 2004, 2009, 2012 and 2014. When not produced, the juice is used for the winery’s entry level Riparosso. The Zanna vineyard was the first planted by the estate, but is one of the last to be harvested. After strong pruning and careful selection of grapes, it is produced only in the best of years. Maceration on the skins lasts 16 days at controlled temperature in stainless steel. Once malolactic fermentation is complete, the wine is transferred into Slavonian oak casks (25 hl in size) where it remains for 24 months, followed by at least 2 years in bottle.